▸ Gender ; Stallion what else ? ▸ Life story ; Walking is not a horse like the others. I know we always say this, but the strict truth. Not really helped his birth, Walking Dead has been abandoned by his parents very early, completely unconscious ... But this white colt had inherited an unpredictable, very Machiavellian and evil, unwholesome. The death was fascinated and amused white stallion to kill all kinds of creatures. "My dress is white and pure color of a bad blood"
White was on top of that very physically strong and intelligent, clever, whimsical. His favorite game was to trap someone or something. The slow and painful death was his deepest pleasure. You could hear moaning after a death. 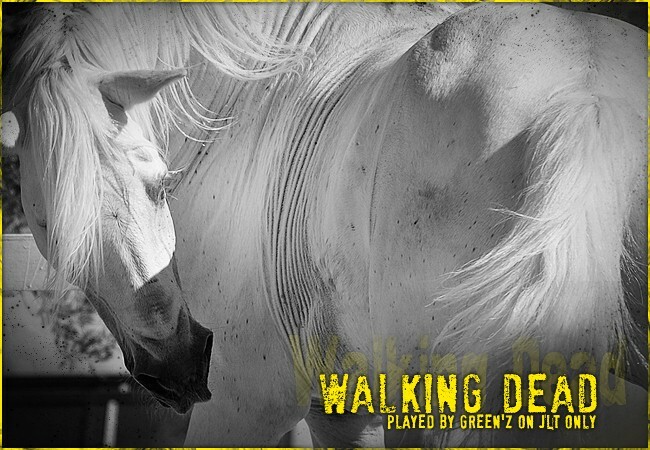 After a while, Walking Dead eventually take the place of the currently dominant when he was a yearling. The herd was completely submissive and very unfortunate death of their former leader. Time passed for 2 years, the dead were repeated and Walking Dead was gaining revenge and madness. Anyone who dared oppose him ran to death. But one day, a young stallion went secretly into his cave and challenged him to a duel was the bay stallion, that's fine. (See story 1). After all these tests, it was total defeat for the White decided to take revenge shamefully trying to kill that son. He failed, but now well separated two clans clashed. The war is launched and Walking Dead is ready to spread death everywhere. ▸ Personality ; As mentioned a bit in history, Walking Dead has real psychological problems. It is a true psychopath. His goal in life is to kill because it makes him happy. It could be defined as really clever and manipulative. He plays with people and does not hesitate to terrorize them to achieve his ends. It has good physical strength and does not hesitate to use them. With him, the fights are very frequent, many scars on his body take shape. In terms of love, he does not know. Only interested in breeding, and again. His main pleasure is to hurt. It is a standard special, almost designed by the devil. Ask me for a topic with my great stallion. Note : It's a psychopat, dangerous. Beware of appearances. Do you want a link or not?